After eating at hundreds of restaurants, it’s often difficult to find a place that offers something different, that something a little bit extra and special. 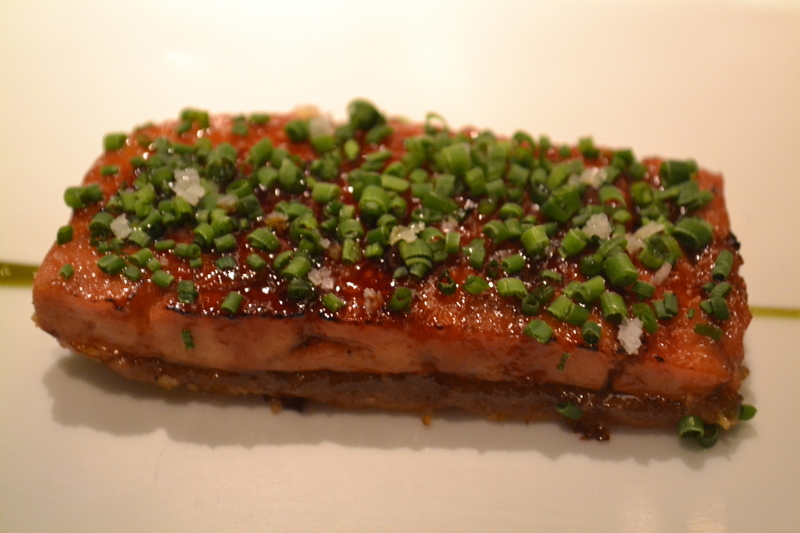 Then comes Cinc Sentits in Barcelona which has quickly cemented itself on my best meals of all time list. 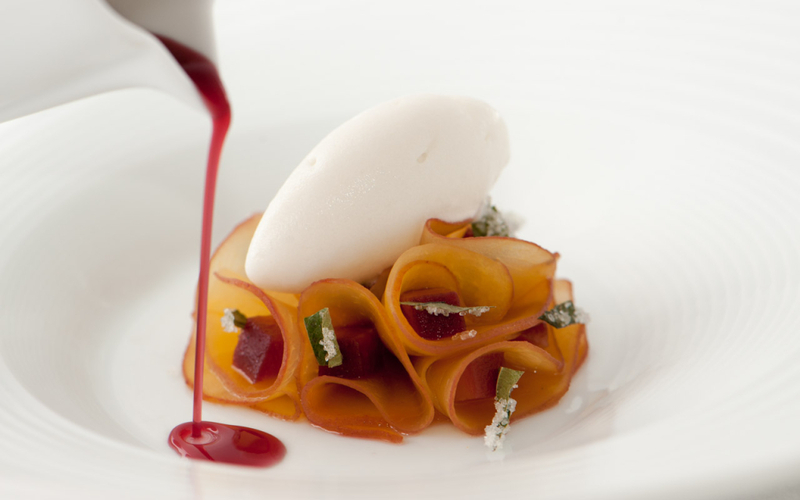 Chef Jordi Artal’s cuisine is rooted in Catalunya’s culinary traditions and utilizes a variety of contemporary techniques to delight the diner’s five senses. After all, the translation of Cinc Sentits means exactly that – “five senses”. 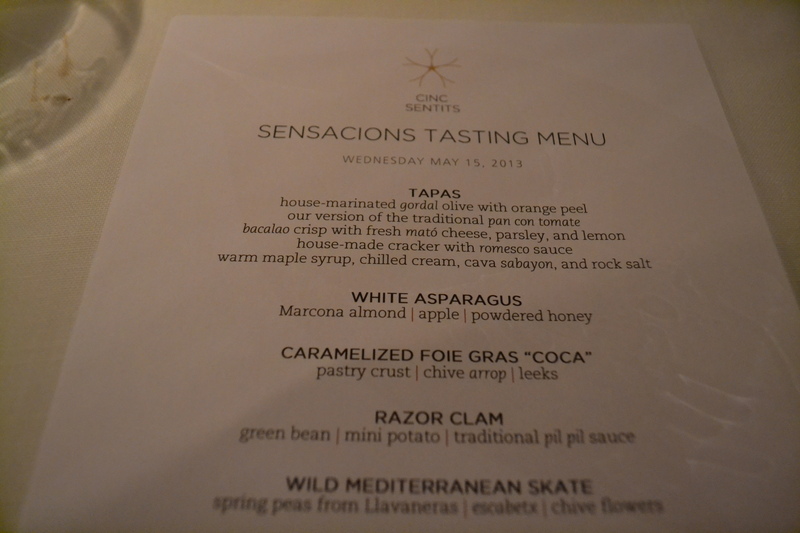 Named one of the six best new restaurants in Spain shortly after opening, Cinc Sentits was awarded a Michelin star in 2008. The venue is effortlessly stylish with clean lines, impossibly crisp white tablecloths and mood lighting which is perfect for a special, romantic occasion. For a small venue of only 29 covers, it is uniquely spacious. Our table for 2 could have easily fit 6, but it made the service feel even more special. Earthly tones and features including pebbles and rocks are placed strategically on tables and throughout the surrounds to warm up the environment. The Sencasions tasting menu (79€ per person) consists of Jordi’s newest seasonal dishes and several signatures and includes tapas, two starters, one fish dish, one meat dish, cheese platter and two desserts. 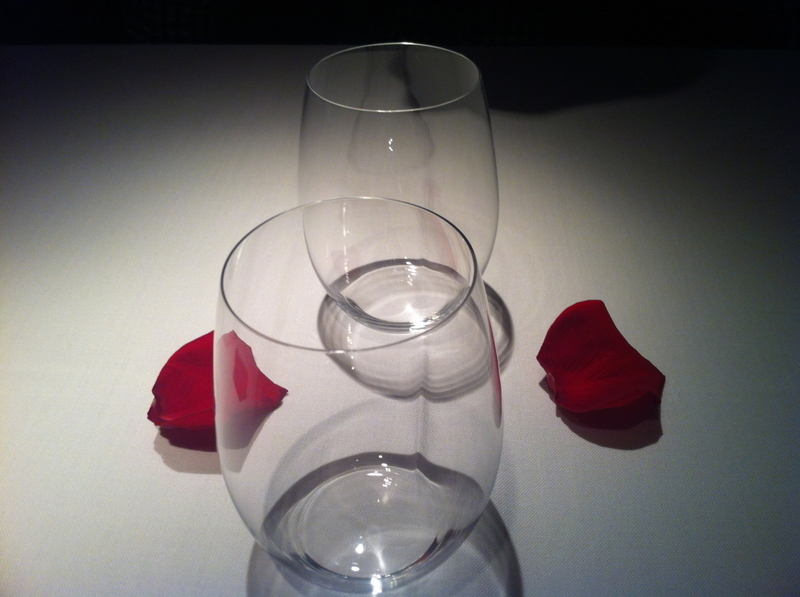 An optional wine pairing can be added for an additional 45€ per person. By working with local purveyors, Cinc Sentits ensures the freshest, highest quality ingredients are sourced from the local region. From the artisanal local cheeses to the organic beef in the Catalan pyrenees, the quality local produce is the heart of its philosophy. Equally impressive is the wine list, offering an extensive selection of award-winning local and international wines including over 200 references. Wine starts at a very affordable €25 per bottle – a rare find in a Michelin starred restaurant. 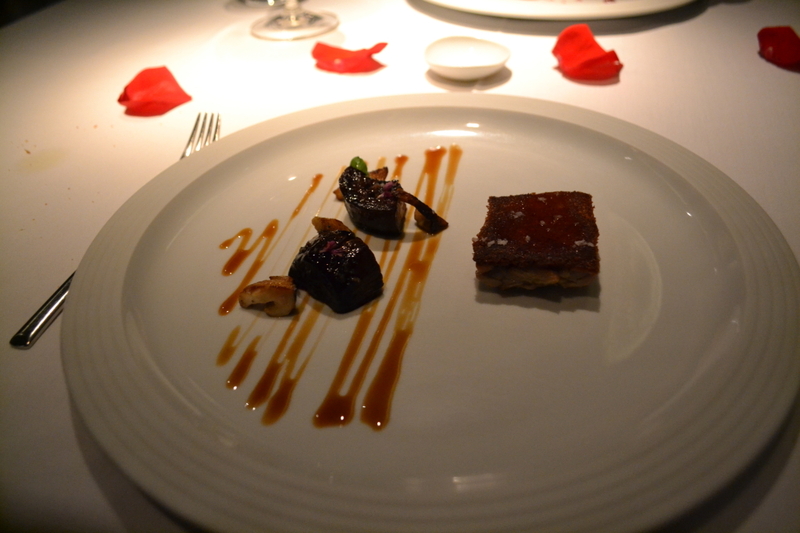 The service at the restaurant was exceptional, friendly and attentive without pretension. First came the tapas selection comprising of a house marinated gordal olive stuffed with tangy orange peel, the pan con tomate, the bacaloa crisp with fresh mato cheese, parsley and lemon and the house made cracker with romesco sauce. I wasn’t sure what to make of the next tapas dish. My initial description – a raw egg in a shot of tequila. 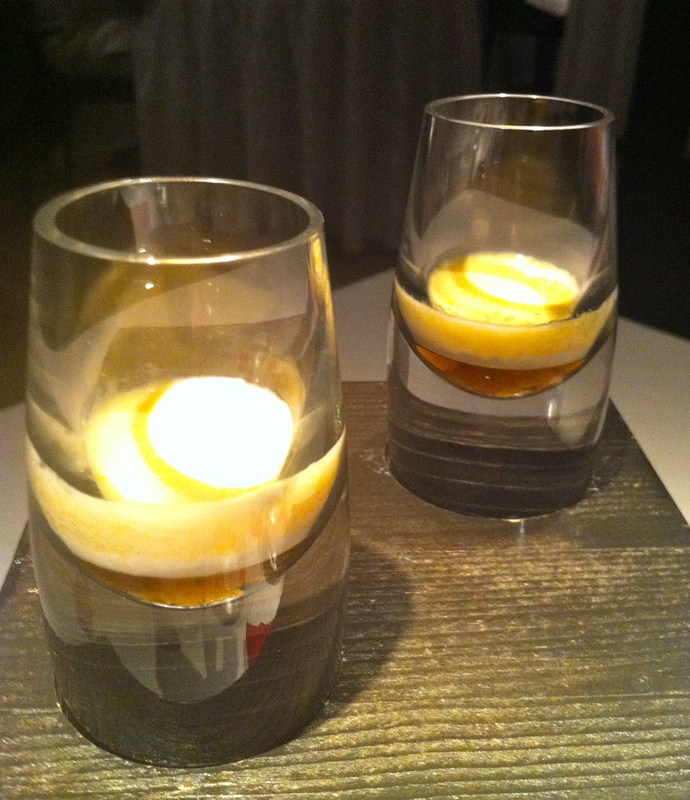 Translated to waiter’s description – a warm maple syrup, chilled cream, cava sabayon and rock salt. However, taste translation….. – creamy, sweet with a bite of salt at the end – it managed to harmoniously mingle hot, cold, sweet and salty elements together like a happy family. The sneaky serve of rock salt at the bottom was a perfect kick to counteract the sweetness. This was pure heaven in a glass. I felt like all my Christmases had come at once. Like all good things, it was just a shame it had to be over so quickly. 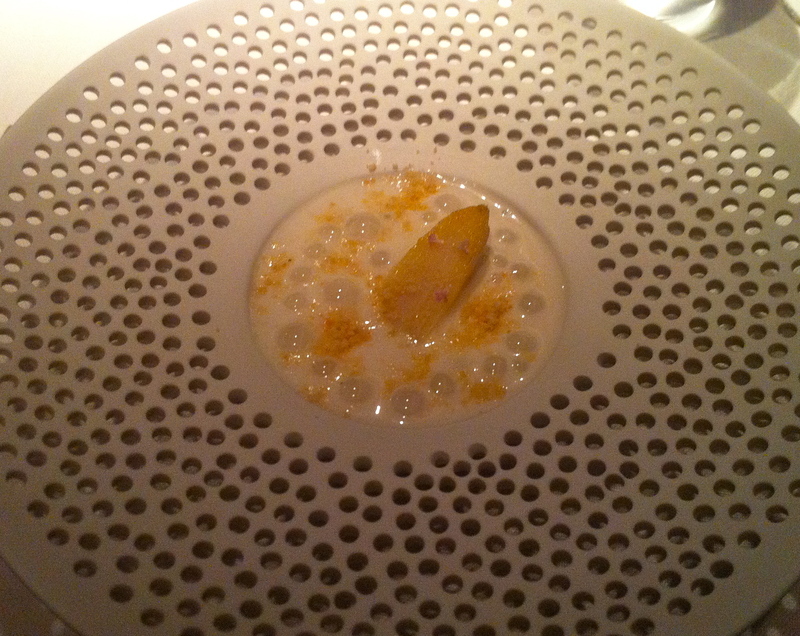 The first starter of the evening was a foaming bubble bath of white asparagus, marcona almond, apple and powdered honey. The dish was creamy and delicate in flavour with the subtle asparagus blending beautifully with the sweetness of the marcona almond and honey. Foie gras “coca” was definitely the winning dish of the evening – a rectangle of beautifully caramelised foie gras served on a bed of leeks confited in olive oil and vinegar with a thin pastry crust. A sprinkling of chives and rock salt gave the dish that touch of savoury, to counteract the sweet tones. I challenge anyone to find something that tastes better than this masterpiece. 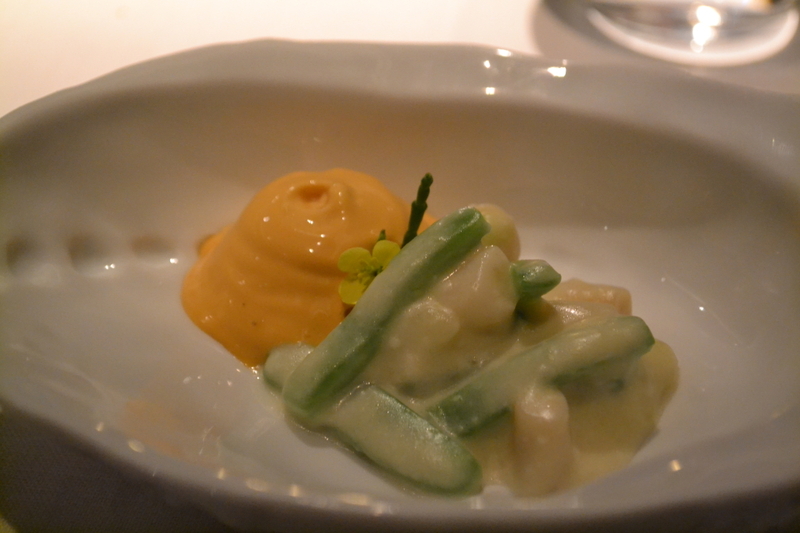 The razor clam was delicately balanced with mini potatoes, green beans and a traditional pil pil sauce , a Basque traditional sauce made of salt, cod, garlic and olive oil which had a perfect texture and thickness. It was good but it was my least favourite dish of the evening. The second seafood dish was the wild mediterranean skate, served in ocean-like yellow foam which was so inviting I wanted to jump right in. 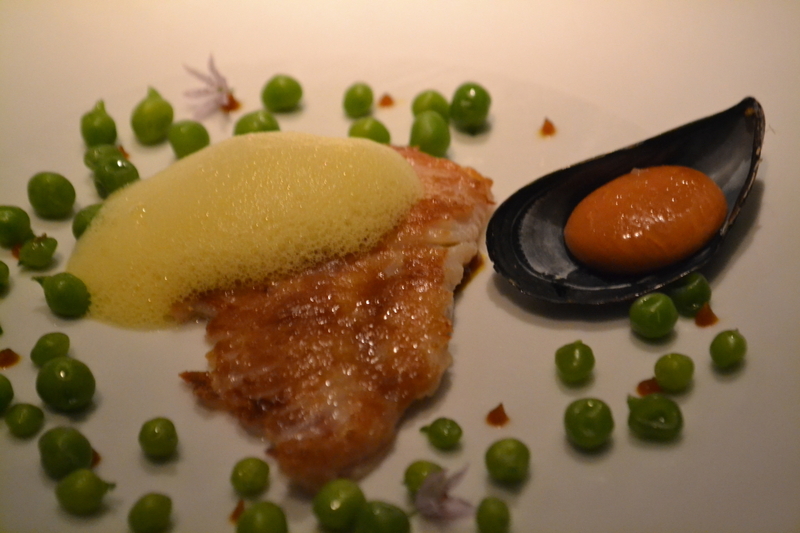 Every element of this dish was brilliantly executed, from the crisp and sweet llavaneras spring peas and the mussel, which literally explodes in your mouth. 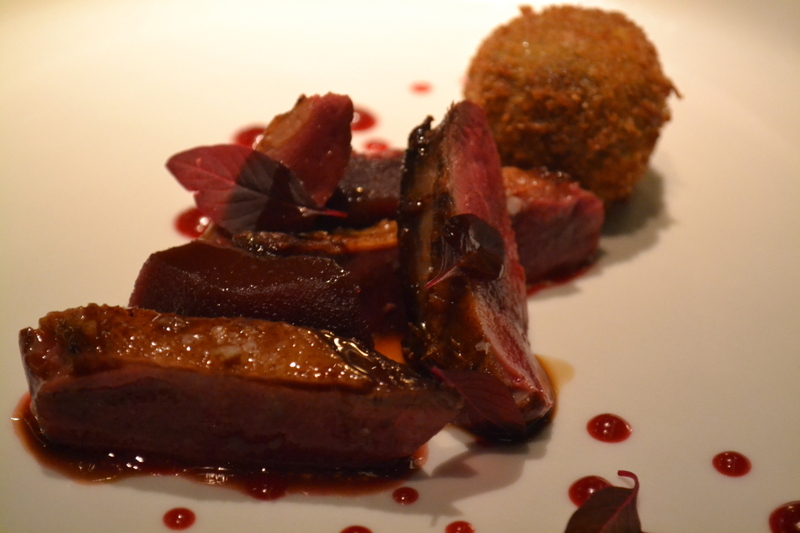 The squab breast was perfectly cooked and caramelised with red wine, poached fruits and a sprinkling of berries which gave the squab a touch of sweetness. The croquetta on the side, had a crisp outer shell and filled with warm liver. 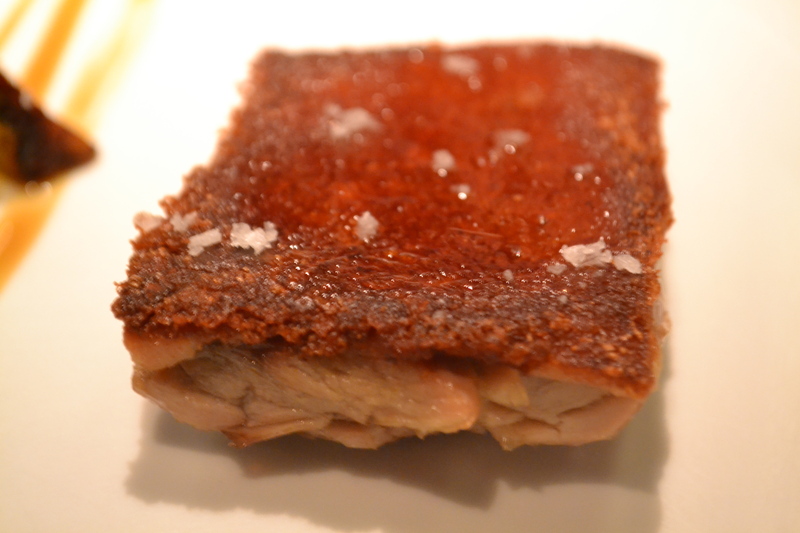 The Iberian suckling pig from Extremadura is renowned for being one of Jordi’s masterpieces and it definitely didn’t disappoint. The pig has a thick, crispy crackling on top which was made extra naughty by a sprinkling of rock salt – the meat itself was unbelievably juicy and tender. I am not a huge eggplant fan but it worked quite well with the basil and wild mushrooms. When I thought I couldn’t fit anymore in, the cheeses arrived – a selection of serra del tormo, botas and uff farmhouse cheeses. Unfortunately I could not have the ratafia sponge cake because it was soaked in walnut oil (very allergic!). As most of you know by now, I have a massive sweet tooth, so of course I can always make room for desserts. And these aren’t just any desserts.. This dessert, left me, well, speechless. 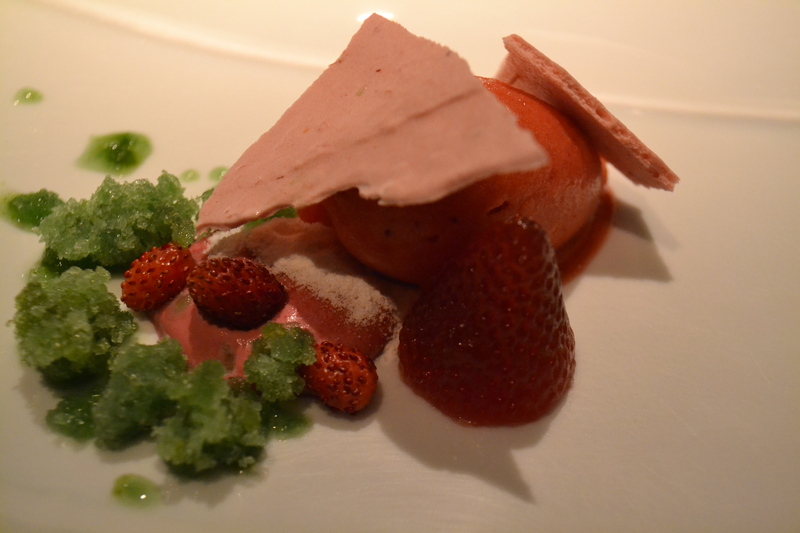 The strawberries sourced locally from the Maresme coast were brilliantly executed in the sorbet which was topped with blackberry cream, yoghurt powder and some kind of strawberry crackling. The celery ice was rich and refreshing and yes tasted exactly like celery. The strawberry in the right foreground was actually a strawberry shaped jelly. Just brilliant! But the best was yet to come. This dessert, served in a coconut shell may look rather unappealing, perhaps resembling some kind of egg gone wrong or an unborn embryo but trust me on this it was one of the best desserts I have eaten – fact! 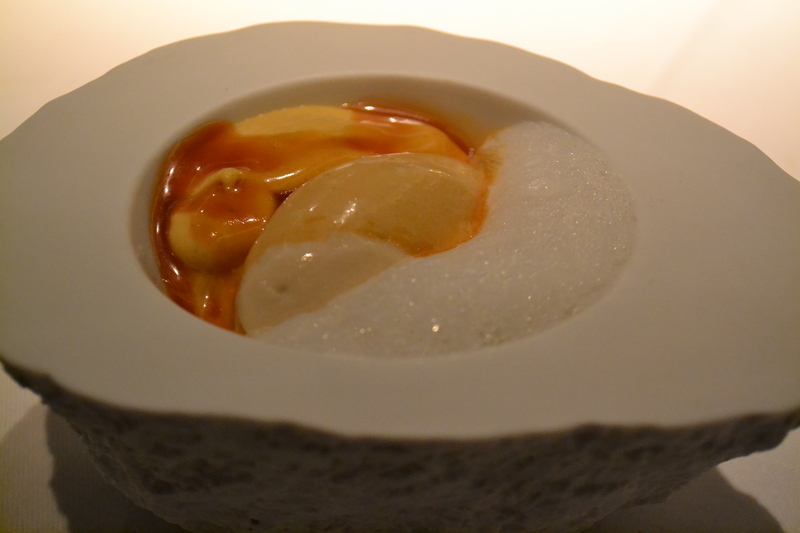 The banana based dessert, served in a frothy bath of foam, with beer ice cream and warm salted caramel sauce was simply delightful. At the bottom of the dish was a hazelnut crumb which added a great texture to the dish. Last, came the “Tanacions” (orange chocolate crisp, with cocoa liquor, forest fruit muffin, mint dark chocolate truffle and bunyol) which were served with a candle since it was a special occasion for us tonight :). The bunyol del cauresma was by far my favourite which reminded me of a light and fluffy version of a cinnamon doughnut. 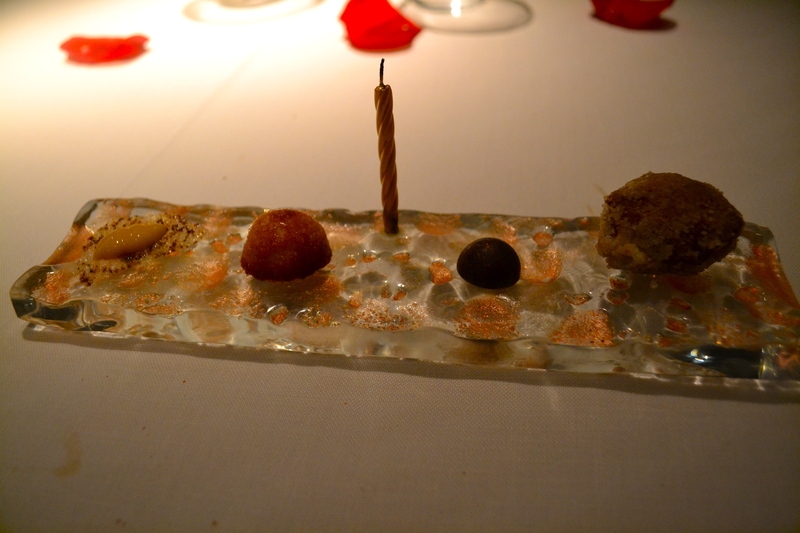 This wasn’t any ordinary dinner, it was more of a food journey – fun, intelligent and inventive. I was shocked to discover that Jordi is 100% self-taught, and before this venture had barely worked in a professional kitchen. 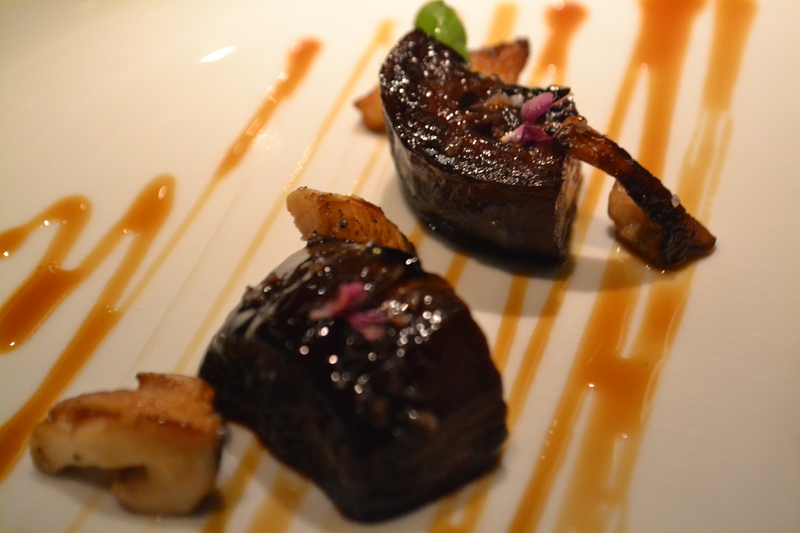 Don’t let this put you off experiencing this restaurant, you are in for a treat! Opening Hours: Open for lunch and dinner Tuesday – Sunday.